I met with Nancy and she explained to me everything about prenup .. About the service.. The office on Westminster and flower you can not miss it.. I went for the free consultation with Kathy. I did my pre research about eviction & she seem to be very knowledgeable. I will ask her to my lawyer for the eviction & I will update another review once my case is close. This review is for the free consultation only & I am please with her advice so far. 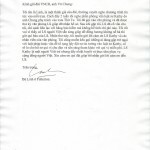 Ms. Luong is involved in my custody trial, which is one of the most emotional and heart-wrenching ordeals to go through. Kathy is extremely competent and possesses all the traits of a great lawyer. She will actually listen to your story and help you navigate through the court system. She will offer real useful advice and not keep you in perpetual conflict so that she can earn more fees. Lastly, and most importantly, Ms. Luong will not over promise. Most lawyers utilize this trick so that they can attract new clients, but she will tell you the truth and what you can reasonably expect as an outcome. I have worked with 7 other attorneys on various matters ranging from personal to business matters and she stands out at the top in her professionalism and conduct. Kathy represented us on an eviction of a problem tenant here in Orange County and was extremely helpful as we are somewhat new to the complicated court process here in CA. Kathy met with my staff on multiple occasions to answer our questions and expectations as well as ensure the tenant was served proper notices and her sharp professionalism must have discouraged the opposing tenant from even challenging the case in court which was a major relief. I’ve been in real estate over a decade and working with Kathy taught me some new things such as the strategy behind not collecting rent from a defaulting tenant. Highly recommend Kathy, and although we’re not looking forward to the next eviction, we will certainly seek out her service and recommend her to you and all to our clients. Thanks again Kathy! Go Bruins! I came to Kathy to have a NDA drafted for my business. She was very attentive and gave great recommendation. I do not recommend trying to draft a NDA yourself! Kathy provided great insight for the NDA that I would have never thought of on my own. I recommend Kathy and will be using her again! This review is long overdue. Kathy was helping me with a landlord tenant issue. She is the epitome of professionalism. She is very responsive and got every thing done on time. The quality of work she provided definitely exceeded my expectations. great service and very professional. Thank you Kathy for helping me throughout the whole process. Highly recommended! Kathy is very honest and hard working. I had Kathy help me with a personal injury case. After my car accident I had a hell of a time fighting the other person’s insurance company. I should say, Kathy and I had a hell of a time fighting the insurance company. It was a messy drawn out process with extensive medical bills and a stubborn opposition. Kathy was patient, honest, set realistic expectations and got the job done! I would recommend her to anyone. promptly and she is willing to take the time to explain all my questions. She was very upfront and her costs are extremely reasonable. I knew I was in the best of hands and my case was settled to the best result possible. I could not be more thankful that I found the law offices of Kathy Luong. I would highly recommend Kathy and her entire office staff to anyone seeking the best representation possible. Thanks Kathy for all your help! 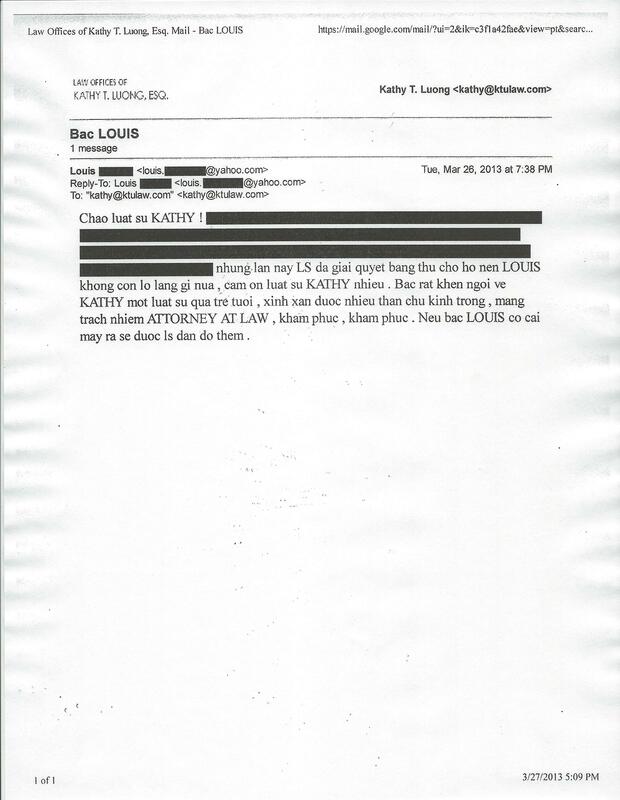 I was running into with legal issue last year and I found Kathy Luong was an answer for me. She was very detail and carefully review my file, and resolved my legal issue smoothly with in time manner. I am really happy with her service. I would use her as my represent in future and would love to recommend everyone need it. Give her a chance to show how profesionalism of her. Thanks Cathy for your help. 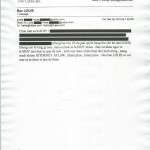 I hired Kathy Luong office with my divorce case. Kathy worked hard to expedite the divorce procedure. She is professional and helped me during a difficult time. I would consider Kathy on any of my legal matters. Thanks Kathy!! …but this time you resolved it by a letter to them so I am not worried anymore, thank you very much. I want to praise you for being such a young lawyer, beautiful having many clients respect you, having the responsibility of being an attorney at law, I admire you, I admire you. If something else happens, I will have you advise me. 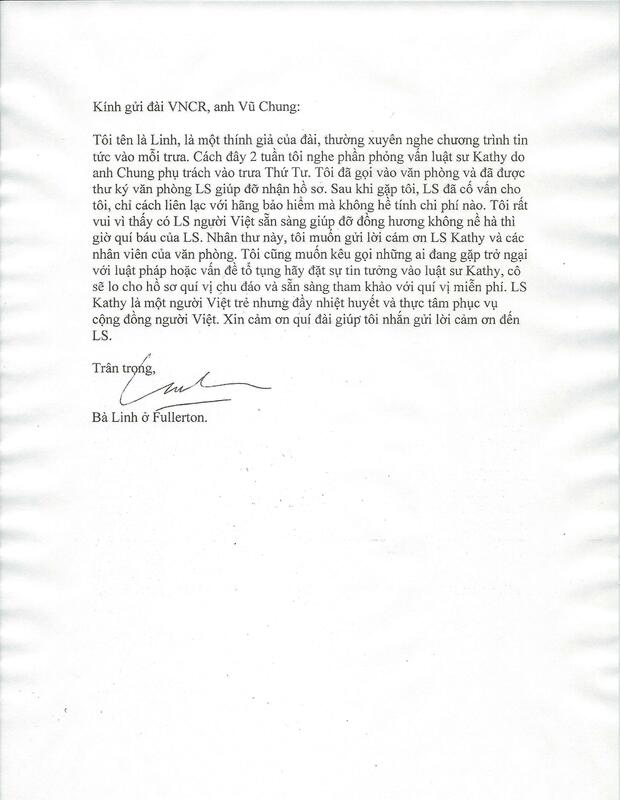 My name is Linh, a listener of the radio station, I often listen to the news program at noon everyday. Two weeks ago I caught an interview of attorney Kathy conducted by Mr. Chung at noon on Wednesday. I then called the office and received the law office’s secretary help in taking my case. After seeing me, the attorney advised me, showed me how to contact the insurance company and never charged any fee. I was very happy because I saw a Vietnamese attorney who is willing to help her fellow people without minding her valuable time. So with this letter, I want to thank attorney Kathy and all the staff at the law office. I also want to call upon anyone who is facing legal obstacles or litigation matters to put your trust in attorney Kathy, she will thoughtfully take care of your case and is willing to consult with you without charge. Attorney Kathy is a young Vietnamese person but is full of enthusiasm and heart to serve the Vietnamese community. Thank you radio station for helping me send my thanks to the attorney.